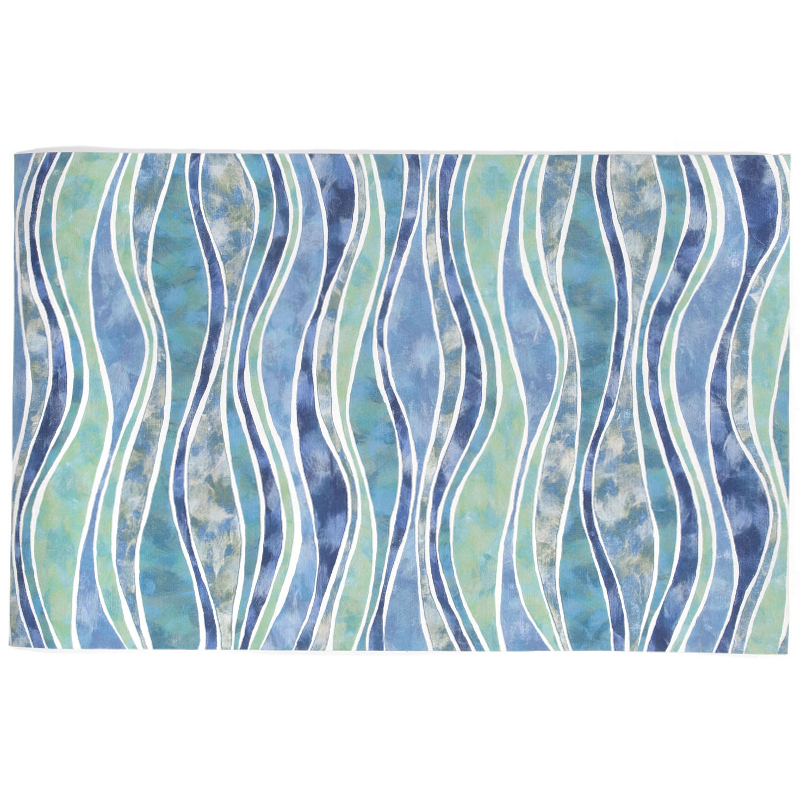 Wave Ocean Rug Indoor/ Outdoor rug features waves of ocean colors. This modern view of ocean waves will freshen up any room or out door area. This is a beach themed rug that is sure to liven up any space. The content and quality of this hand tufted, synthetic blend rug will hold up to indoor or out door use. All these rugs offers a rich textural surface while being durable enough for any high traffic area of your beach home. Intricately blended colors add visual appeal to these designs. The highly detailed painterly effect is achieved by Liora Mannes patented Lamontage process which combines hand crafted art with cutting edge technology. These rugs are Hand Made of 100% Polyester fibers that are intricately blended together using Liora Manne's patented Lamontage process. They are then finished using modern needle punching and latexing processes that create a work of art that is practical The flat simple nature of these Lamontage rugs is an ideal base with which to create a rug that is at the same time a work of art. Perfect for any Indoor or Outdoor space, they are antimicrobial, UV stabilized, and easy care. The highly detailed painterly effect is achieved by Liora Mannes patented Lamontage process which combines hand crafted art with cutting edge technology. These rugs are Hand Made of 100% Polyester fibers that are intricately blended together using Liora Manne's patented Lamontage process. They are then finished using modern needle punching and latexing processes that create a work of art that is practical The flat simple nature of these Lamontage rugs is an ideal base with which to create a rug that is at the same time a work of art. Perfect for any Indoor or Outdoor space, they are antimicrobial, UV stabilized, and easy care. Vacuum regularly. Sponge spots to clean. To clean full rug, gently rinse with a solution of mild detergent and water. Hose rug clean, lift off ground allow to dry thoroughly. Reducing exposure to rain and moisture will prolong rug life.